When You Don’t Feel Saved? “I know whom I believed, and am convinced that he is able to guard what I have entrusted to him for that day,”(2 Timothy 1:12 NIV). Anna grew up in the church. It wasn’t a church that used the word “salvation” or “saved” very often and there was never a decisive moment she could recall “giving her life to Jesus,” as she heard her more evangelical friends recount. There was no “born again” experience that she could recall. But she did love Jesus. She’d loved Him for as long as she could remember. But, she was not sure if she was actually saved. Beth remembers walking down the red carpeted aisle of her church when she was twelve-years-old. She filled out a membership card, signed up for the next baptism service and attended the catechism class for new believers. She still remembers the feeling when she knew that she was a sinner who needed a Savior, and she wanted to follow Jesus more than anything. Can you see how each one of these women has believed the lie that they have to earn their way to heaven? And then earn the right to keep it? Why? Because they are depending on their feelings rather than the truth. Paul wrote to the Ephesians, “And you also were included in Christ when you heard the word of truth, the gospel of your salvation. Having believed, you were marked in Him with a seal, the promised Holy Spirit, who is a deposit guaranteeing our inheritance until the redemption of those who are God’s possession to the praise of his glory” (Ephesians 1:13-14). Having believed, you were saved. Totally accepted. Past tense, finished, complete. In Ephesians chapter 6, Paul tell us to put on the full armor of God. The very first piece of armor is the “helmet of salvation.” We’ve got to know that we have moved from rejection to acceptance, from guilty to forgiven, from condemned to saved. If Satan can cause you to doubt your salvation, he will gain a strong foothold into your conquered territory. Once you are saved, he can’t do anything about the reality of your salvation. You are signed, sealed, delivered…you are God’s—signed by God with the blood of Christ, sealed by the Holy Spirit for all eternity, and delivered from the domain of darkness and transferred to the kingdom of Christ. Amen! What does Paul mean when he tells the Ephesians to “put on the helmet of salvation?” A helmet is designed to protect a soldier’s head, and the helmet of salvation is designed to protect a Christian soldier’s mind. In order to have victory in the spiritual battle we face every day, we must make sure that the helmet of salvation is seated securely on our minds and strapped snuggly in place. Once you accept Jesus as your Savior, Satan can’t do anything about your position in Christ. However, he can do much to try and confuse you or cause you to doubt your salvation. Remember, he is the father of lies. It’s what he does. It’s who he is. There may be days when you don’t feel saved. Well, rain on your feelings. They are not the truth. “Believe in the Lord Jesus Christ, and you will be saved” (Acts 16:31). You may not feel that you are saved, but you can know that you are saved. Timothy wrote, “I know whom I believed, and am convinced that he is able to guard what I have entrusted to him for that day.” Timothy had the chinstrap of the helmet of salvation strapped snuggly in place and he knew he was saved no matter how he felt. That’s what faith is all about–believing God regardless of, or in spite of, our feelings. So where’s your helmet today? Is it strapped firmly in place? Dear LORD, once again, I thank You for saving me. Sometimes I don’t feel like I’m any different than I was before I said “yes” to You. But I believe by faith, regardless of how I feel. I stand firm in the knowledge of my salvation, my eternal inheritance, and my identity as a child of God. OK, here’s the test. You mess up. Really mess up. The devil says to you…how can you call yourself a Christian? You must not be a Christian after all? What are you going to tell him? This is an open book test. Click over to my Facebook page and leave your answer. 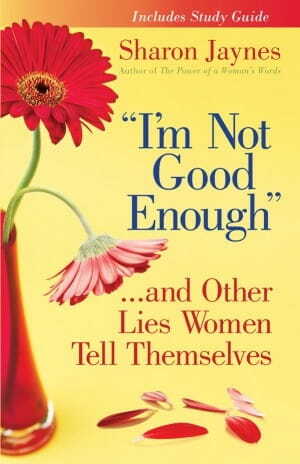 Today’s devotion was taken from my book, I’m Not Good Enough…and Other Lies Women Tell Themselves.If you’ve been believing the enemy’s lies that you are not good enough, totally worthless, would be happy if…, etc. and are ready to begin living in victory by believing God’s truth, then this book is for you! It’s time to be set free to see yourself as God sees you: His holy, chosen, forgiven, and dearly loved child. Now that’s a truth worth repeating. And for the married GiG’s check out my latest book, A 14-Day Romance Challenge: Reigniting Passion in Your Marriagewith over 250 ways to romance your man.